Commemorative Swiss stamps of 1964 to 1966 highlight a number of important special events. During this period, the Swiss Post continued the practice of issuing most of the commemorative stamps for a particular year at one time, usually in the Spring. For stamp collectors, this practice makes Swiss commemorative stamps very easy to manage and organize. Of course there are exceptions, like the annual EUROPA stamps, but they are usually few in number. 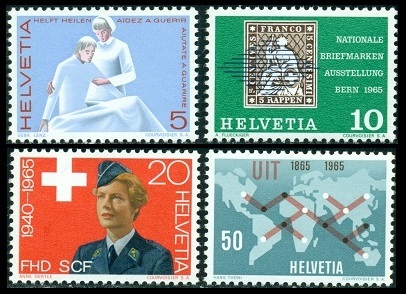 The four commemorative Swiss stamps shown above (Zu. #406-09, Mi. #791-94, Sc. #434-37) were all issued on March 9, 1964. The 5 C. denomination stamp was issued to publicize the Opening of the Greater St. Bernhard Trans-Alpine Automobile Tunnel between Switzerland and Italy. The 10 C. denomination stamp was issued to publicize the "Pro Aqua" Water Conservation Campaign. The 20 C. denomination stamp was issued to commemorate the 100th Anniversary of the Swiss Non-Commissioned Officers Association. The design features non-commissioned officers of 1864 and 1964. The 50 C. denomination stamp was issued to commemorate the 150th Anniversary of the Geneva joining the Swiss Confederation. 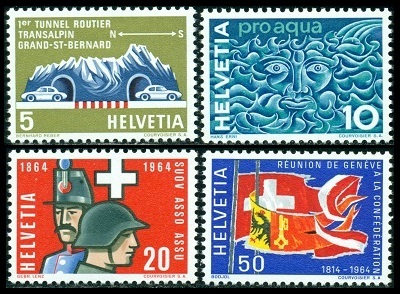 The four commemorative Swiss stamps shown above (Zu. #428-31, Mi. #808-11, Sc. #462-65) were all issued on March 8, 1965. The 5 C. denomination stamp was issued to honor Nursing and Auxiliary Medical Professions. The design features a nurse and patient. The 10 C. denomination stamp was issued to publicize the National Philatelic Exhibition (NABRA), held in Bern from August 27 to September 5, 1965. The design pictures the 5 Rappen denomination of an 1854 Imperforate Sitting Helvetia postage stamp with a lozenge cancel. The 20 C. denomination stamp was issued to celebrate the 20th Anniversary of the Women's Army Auxiliary Corps. The 50 C. denomination stamp was issued to commemorate the 100th Anniversary of the International Telecommunications Union, originally called the International Telegraph Union. Two other stamps were also issued for this commemoration in September 1965. The souvenir sheet shown above (Zu. WIII #43, Mi. Block 20, Sc. 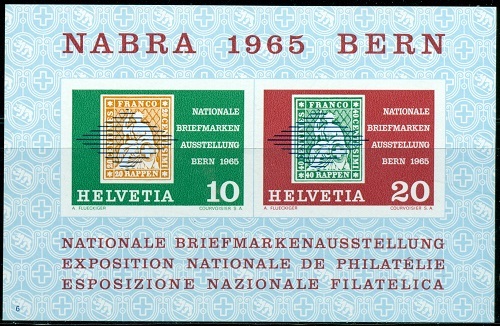 #B344) was issued for the National Philatelic Exhibition (NABRA), held in Bern from August 27 to September 5, 1965. This is the companion issue to the regular commemorative 10 C. postage stamp described in the previous section, though the imperforate stamp designs in the souvenir sheet depict differing denominations of the 1854 Imperforate Sitting Helvetia postage stamp series. The souvenir sheet measures 94 x 61 mm., and it sold for 3 Francs. The proceeds from the sale of the souvenir sheets benefited the exhibition and the promotion of Swiss philately. The three commemorative Swiss stamps shown above (Zu. #432-34, Mi. #819-21, Sc. #466-68) were all issued on June 1, 1965. The 20 C. denomination stamp shown above, at the top, was issued to commemorate the 150th Anniversaries of the Cantons of Vallais, Neuchatel, and Geneva joining the Swiss Confederation. The 10 C. and 30 C. denomination Swiss Alps series stamps shown above, at the bottom, were issued to commemorate the 100th Anniversary of the First Ascent of the Matterhorn (14,692 ft.). These two stamps were only available for sale on Swiss Alpine Post Buses. 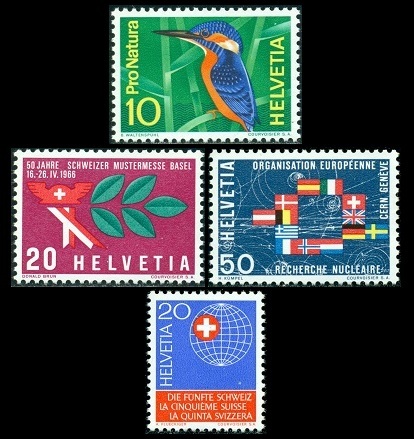 The three Swiss stamps shown above (Zu. #436-438, Mi. #822-24, Sc. #470-72) were all issued on September 14, 1965. The 20 C. denomination stamp shown above, at the top, was issued to publicize the World Figure Skating Championships to be held in Davos in February 1966. The 10 C. and 30 C. denomination stamps shown above, at the bottom, were issued to publicize the International Telecommunications Union Congress and to commemorate the 100th Anniversary of the International Telecommunications Union, originally called the International Telegraph Union. The three commemorative Swiss stamps, shown in the upper part of the image above (Zu. #439-41, Mi. #833-35, Sc. #473-75), were issued on February 21, 1966. The 10 C. denomination stamp was issued to publicize the International Congress for Conservation, held in Lucerne. The design pictures a European Kingfisher. The 20 C. denomination stamp was issued to celebrate the 50th Anniversary of the Swiss Trade Fair. The fair was held in Basel from April 16 through April 26, 1966. The 50 C. denomination stamp was issued to publicize the European Organization for Atomic Research. The stamp shows the flags of the member nations. The 20 C. denomination stamp, shown at the bottom of the image above (Zu. #442, Mi. #841, Sc. 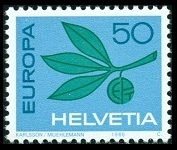 #476), was issued on June 1, 1966 to celebrate the 50th Anniversary of the Society for Swiss Living Abroad. The 10 C. denomination Swiss Alps series stamp shown above (Zu. #445, Mi. #842, Sc. #479) was issued on September 26, 1966. The stamp pictures the Finsteraarhorn (14,022 ft.). The two EUROPA stamps shown above (Zu. #410-11, Mi. #800-01, Sc. #438-39) were issued on September 14, 1964 to emphasize European Unity. The EUROPA stamp shown above (Zu. #435, Mi. #825, Sc. #469) was issued on September 14, 1965 to emphasize European Unity. The two EUROPA stamps shown above (Zu. #443-44, Mi. #843-44, Sc. #477-78) were issued on September 26, 1966 to emphasize European Unity.